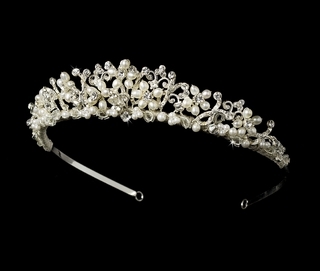 You will feel like royalty in this stunning tiara, a memory of all of your favorite fairy tales. 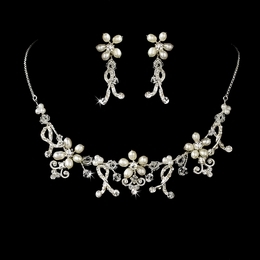 The floral pattern is crafted with ivory freshwater pearls, rhinestones, and sparkling Swarovski crystals. The ends of the band have pin loops that allow you to easily fasten the tiara into your hair style with bobby pins. Size: The ornamented portion of the band measures 8" wide and 1-1/4" tall at its peak.